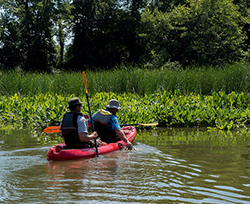 Providing science-based information, tools, and skills to promote resilient communities and clean and healthy streams, rivers and watersheds of the Chesapeake Bay. This one day course is focused on the identification and management of terrestrial invasive plant species on public lands. It will cover the challenges that invasives pose across the Chesapeake Bay region and how to plan their control. It is taught in partnership with the Maryland Dept of Natural Resources and private consultants. It will be both classroom and field based. There is Western Shore and Eastern Shore Course.